Their arms are dangling and some of their heads are missing. Most are undressed after being changed in and out of formal wear day after day. They’ve attended weddings, galas, movie premiers. Yes, these ladies have lived a life of privilege. But now they lay in a plastic bin, untouched and unkempt. Doctors and veterinarians, chefs and super heroes, all collectively meshed together. “I’m too old for them,” she told me last week, “you can pack them up”. I watched from a distance as she rummaged through her closet looking for skinny jeans. I didn’t say a word even though it was a tough pill to swallow. Maybe it was because I remember balancing a Barbie in one hand and a cup of coffee in the other while we made up elaborate scenes and sordid stories for these ladies. Half a day could go by when we delved into their little world. I slid the box back under her bed, not quite ready to pack them away, even though I know their exit is imminent. 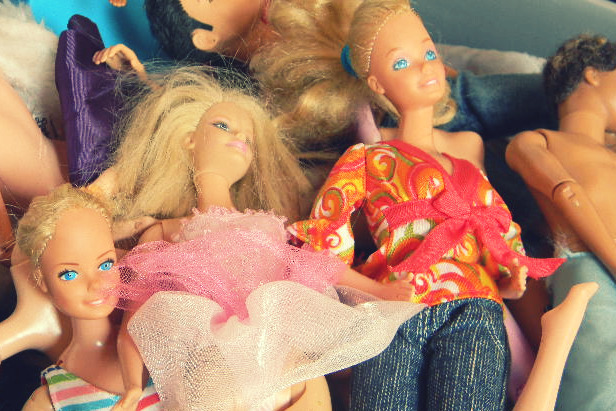 I hope these Barbies know how lucky they were; they were in good hands for a lot of years. Boy, do I know the feeling Amanda. At my house it was matchbox cars instead of barbies. Time flies and they move on to the next phase in thier lives. Savor each moment and you will hold on to those memories for a life time. The next phase has it’s memories all it’s own. Who says when she is not looking you can’t get them out and play with them yourself, reliving the memories! Oh bittersweet — the growing up, the moving on. It’s hard, isn’t it?